26 When your hard work produces a new account, you are on your way to achieving great things. If you continue finding new accounts, this will make you a great company asset. Still, you have to be working it 24 hours a day, 7 days a week, 365 days a year. As soon as you return from a sales trip, you should be planning your next. When on the road, try to visit four to six suspects a day: two between 8 a.m. and noon and two between 1 p.m. and 5 p.m. I know this sounds aggressive, but I also know it can be done. 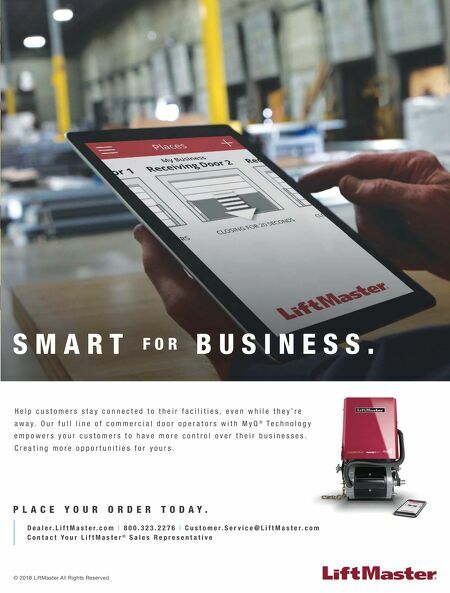 By Roy Bardowell CDDC SALES&MARKETING 26 International Door & Operator Industry™ Continued on page 28 Part Two After a big success, you need to work even harder now to attain another account with equal purchase power. This is to protect your company from disaster in case one of your accounts one day decides to buy elsewhere. When I tell garage door salesman they need to repeat their sales numbers to protect the company from potential disaster, they think I'm crazy, but it makes sense for this reason. As an industry supplier, you will have to purchase more raw materials to produce the goods required for your new accounts. As long as you are producing the needed cash flow, everything will be fine. But let's say your newest account decides to buy elsewhere or not pay after you made a large expensive purchase of materials or other investments, and the piggy bank is dry. That's where the other accounts come in to make up for the loss. Essentially, if you have one big account paying $500,000 per year, you need another similar account. If one abandons you, there will a buffer that will reduce the impact on your company. Garage door repair is like other service industries: it's a business, not a hobby or charity. All your salespeople must share and practice this philosophy, and most importantly: know the goal! Plain and simple–the goal is to sell product and profit from the sales. As an industry vendor, you have to remember that door companies will expect your very best, and better than the company you are trying to bump. Bumping a competitor is not as easy as going in with better pricing. 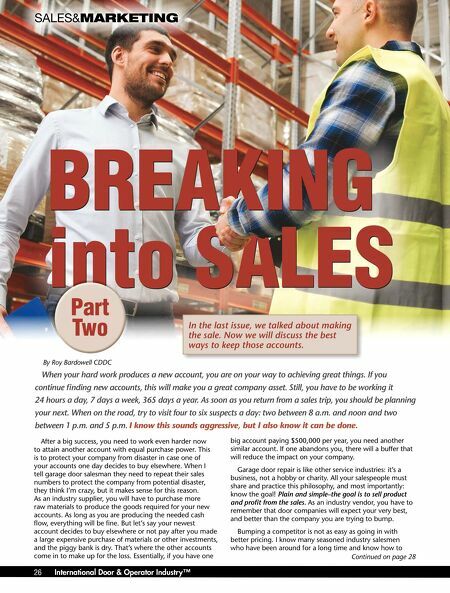 I know many seasoned industry salesmen who have been around for a long time and know how to In the last issue, we talked about making the sale. Now we will discuss the best ways to keep those accounts.